The AOA elves are back to help you with your holiday shopping. For the next couple of weeks we'll be bringing you fun, interesting, local gift ideas for the holiday season. OK, this one is for that person in your life that has absolutely everything. You know the type. It's also good for the particularly eco-conscious person. 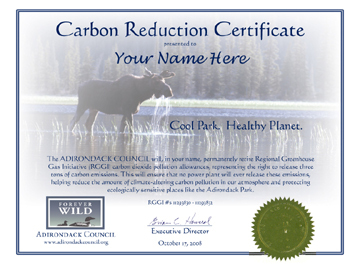 Carbon reduction certificates from the Adirondack Council. Because what says love more than helping preserve clean air? For a $25 contribution to the Council's "Cool Park/Healthy Planet" program, the non-profit organization will permanently retire three tons of carbon dioxide from the Regional Greenhouse Gas Initiative program, the first multi-state effort in the country to make measurable reductions in carbon emissions. You get a nice little certificate that you can customize on the website so you can make it out to the recipient. There's also some other cool things for sale on the website. All commercial power plants in the ten participating northeastern states must acquire one RGGI (also known as "reggie") allowance for each ton of carbon dioxide they release into the atmosphere. They do that through a type of "allowance auction." 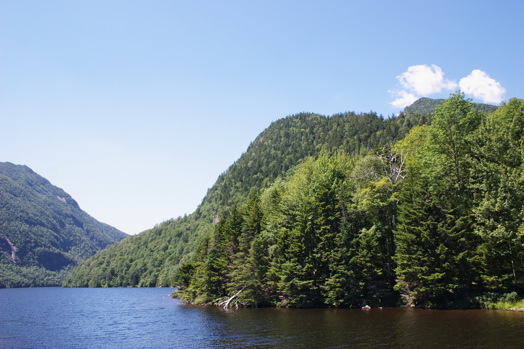 The Adirondack Council participated in that auction, buying up a bunch of allowance credits. Then they established the certificate program to permanently retire carbon pollution allowances in a reggie account. The enviro organization also works on other world-wide efforts to reduce emissions and mitigate the impacts of climate change through the "Cool Park, Healthy Planet Program." So why not reduce some carbon emissions in your loved ones' honor this year? Your eco-conscious loved ones, your kid's science teacher, or the person who already has everything. I bought one for one of my brothers, a budding environmentalist, last year and he seemed to dig it. From the Albany-based Adirondack Council's online shop or by calling 877-873-2240 any weekday between 8:30 a.m. and 5:30 p.m. These are great! I bought one to give to my tree-hugging buddies and they flipped. They are getting them for their friends and family now. I put mine up in the repair shop and get a lot of comments about it. People want to know what it is and how I got it. I think a lot of people are mad that the Congress won't do anything about climate change.